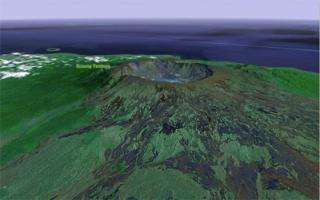 History's largest volcanic eruption destroyed the island kingdom of Tambora in 1815 and now the first remnants of a Tambora village have been found. The eruption of Mount Tambora on the Indonesian island of Sumbawa in 1815, the largest volcanic eruption in human history, killed 117,000 people and extinguished the tiny kingdom of Tambora. After 20 years of research, a scientist from the University of Rhode Island’s Graduate School of Oceanography has located the first remnants of a Tamboran village under 10 feet of ash and has unearthed the first clues about its culture. In a six-week archaeological dig in the summer of 2004, URI Professor Haraldur Sigurdsson and colleagues from the University of North Carolina and the Indonesian Directorate of Volcanology excavated a Tamboran home where they found the remains of two adults as well as bronze bowls, ceramic pots, iron tools and other artifacts. The design and decoration of the artifacts suggest that the Tamboran culture was linked to Vietnam and Cambodia, and its language was related to that of the Mon-Khmer group of languages that are now scattered across Southeast Asia. During the eruption, Mount Tambora ejected up to 100 cubic kilometers of magma and pulverized rock, and it spewed ash and 400 million tons of sulfurous gases 44 kilometers into the atmosphere. The gases that lingered in the atmosphere caused a year of global cooling in 1816 that is now known as “the year without a summer” and which caused disease epidemics and worldwide food shortages due to crop failures. The growing season in New England declined by 100 days that year, which led to the start of a movement by farmers to abandon farming in the region and move west. A guide hired by the URI scientists during their second visit to the island told them about ancient objects the local people had found in the jungle 25 kilometers west of the caldera. When Sigurdsson returned to visit the site in 2004, he explored a gully that cut through a 10-foot thick deposit of volcanic pumice and ash where he soon found the first evidence of the village – pottery shards and carbonized lumber. Using radar to look deep into the ground, the scientist quickly found and unearthed a small house built on stilts that rest on foundation stones. Based on the artifacts he found, particularly the many bronze objects, Sigurdsson believes that the Tamborans were “not poor people at all. They were actually quite well off.” Historical evidence supports that belief, as Tamborans had been famous in the East Indies for their honey, horses, sappan wood for producing red dye, and sandalwood used for incense and medications.